The templates have a minimal Linux installation, and are missing key RPMs needed for installing Oracle database or application software. In the past, I’d managed to take the existing templates available from Oracle and convert them over to an LVM format, but I decided to go with a fresh installation and build the template from there. This post goes through the process of taking an existing “gold image” VM and building a configuration script that runs upon first boot of the VM. It can be validated with a simple “yum repolist” command. If the “ol7_addons/x86_64” line shows up, then you’re good to go. Now that we have the packages in place, it’s time to start configuring ovmd so that we can finalize the interactive prompts. Configuration scripts have been categorized, so that you can enable specific items that are interesting to your configuration. You can view/enable/disable these with the ovm-chkconfig command. There are two main options that are relevant in the output – configure and cleanup. When preparing a virtual machine as a template, the cleanup script will remove all settings for the items where “cleanup” is set to on. On next boot of the virtual machine, scripts marked with “configuration” set to on will be run when the VM is placed in configuration mode. In the example below, the cleanup process will remove settings for all modules with the exception of firewall and selinux (they’re set to off). The scripts are built to receive sets of key/value pairs for various configuration items that can be passed through a number of methods (more on that in a later post). You can use the ovm-template-config command to see the key/value pairs that are available for a specific module. A good example is the network module, shown below. Items listed with “‘hidden’: True” will not be queried, but can be set through the various APIs made available by Oracle. In order to see all of the options available at the time of configuration, remove the “–script network” piece of the above command. At this point, everything is in place to clean up the current VM and enable the configuration script. Run these commands and shut down the VM. The first command runs the cleanup script, and the second command enables the configuration mode. It can now be used as the source for all new VMs created. 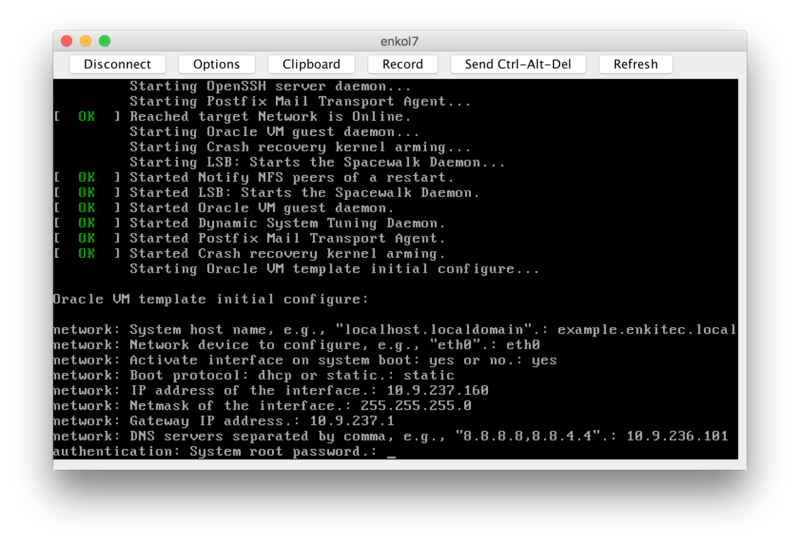 When the cloned VM boots up, it will ask for a hostname, IP address, subnet mask, gateway, DNS server, and root password. This functionality can be extended even further using the VM messaging functionality in Oracle’s VM Manager or the OVMcli interface. More on that in a future post.